Wiz Khalifa, ScHoolboy Q, A$AP Ferg, Vince Staples, Kehlani, Lil Yachty and Giggs. 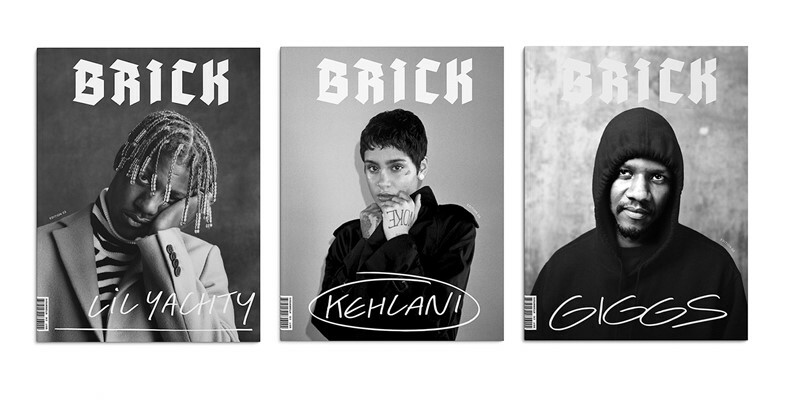 It sounds like the line-up for the new generation rap, hip hop and R&B festival of your dreams, but instead, it’s a roll call of the cover stars that BRICK magazine has collaborated with in just three editions. Hitting shelves next week is its latest, Edition 03, fronted by Kehlani, Yachty and Giggs – the latter who has just cemented listening space in eardrums around the world with features on Drake’s More Life “playlist”. With a hefty 244 pages, readers can expect interviews with RZA on veganism, a hilarious roundtable with members of Awful Records, interviews with all cover stars, poetry from Kojey Radical, a New Zealand road trip with Denzel Curry and advice from Jay Boogie, to name a few. Also included is an exploration of the archives of New York-based photographer Jonathan Mannion, that includes Aaliyah and Outkast. With a redesign from Catalogue and a move to glossy paper to amp up its imagery, BRICK is available to pre-order now and will officially release on 27 March, followed by a launch party in Los Angeles next month (keep an eye on BRICK’s Instagram for details). In celebration, founder and editor-in-chief, Hayley Louisa Brown shares BTS footage from Yachty’s cover shoot, spreads from the edition and chats to us below about what else we can expect... and what's next. Tell us about the covers stars for this edition – what made you choose them? Hayley Louisa Brown: I touch on this in the editor’s letter, but the theme of the magazine organically became independence and our three cover stars all, in their own ways, embody this to me. Giggs has always been incredibly, for lack of a better synonym, independent in every aspect of his career. He’s been authentic to himself from the start, and it’s so admirable to see him reaching huge milestones from his own hard work and dedication. I see him as the people’s champion of UK music. Kehlani, to me, has demonstrated so much inner strength to come back with an amazing album after facing such a deep struggle with her mental health. Her interview is so touching and important to read at a time where pressures on young women in the media are so intense. And finally, Lil Yachty! Yachty is the future of music. He’s still so young, of the age where it’s normal to grow up with the internet and be exposed to so many genres and decades of music at once via platforms like YouTube and Spotify. It means that genres are mashed up more than ever, and Yachty is proof that creating a new sound is still possible. He’s defined his independence by refusing to follow in the footsteps of anyone who came before him, and it shows in little things like his choice of soundtrack on our cover shoot. He played Arcade Fire and Coldplay, and sang along to every word. He’s so much fun, and fun is important right now. Why did you decide to do the redesign with Catalogue? Hayley Louisa Brown: We’ve been lucky enough to work with the amazing team at POST for the first two editions of the mag, and moving onto Edition 03 it was equal parts fun and terrifying to take it back to a blank page and start over. We’ve been good friends with the guys at Catalogue for a long time, they actually produced the first ever BRICK T-shirts we made for the Edition 01 launch! I’ve also worked with the guys on photography zines too and we have a very similar bank of reference points, so it seemed like a perfect fit to do BRICK together. The love of music we share has brought a sense of design that’s influenced by the artists we’re featuring, which is super cool to me. Catalogue have captured that perfectly; they’ve incorporated influences from old music zines and produced something that flows easily from one story to the next. Each editorial has its own distinct identity and the whole magazine feels full of personality. The editions are always incredibly thoughtful, curated and packed. How do you decide what to put in each edition? Hayley Louisa Brown: Thank you for saying that! The planning process generally starts with a wish list of people we want to feature in the magazine. It’s so long, I have no idea how many issues it’ll take us to even get through half of it, but that’s the exciting part. We generally prioritise who and what we’d like to feature, and then work from that to create a well-rounded selection of artists that are complementary to each other. It’s also very much about which creatives we want to work with – there are so many photographers and writers and stylists who we’re looking forward to collaborating with too. What are your personal highlights from this edition? Hayley Louisa Brown: As a photographer, I feel incredibly honoured that Jonathan Mannion took so much time out of his crazy schedule to work with us on sharing some of his photographic archive. He took the time to show Ollie (Shaw, one-half of Catalogue) around his studio in New York to pull out some never before seen contact sheets to include in the feature, as well as talking to me on the phone a bunch of times to share the stories behind his images – all whilst hobbling around between huge jobs and different countries on a broken ankle. That was exciting to me. I’m also really proud to have Giggs on our cover, shot by the amazing Olivia Rose, for reasons I’ve mentioned above. But again, it was just so important to us, as a British publication, to showcase the UK. Giggs has been doing his thing on his own terms for so long, I’m so pleased this cover has released just as he’s been touring with Drake – he’s so deserving of having the light shine on him. You said to It's Nice That, it's important to make "sure we do the right thing instead of the easy thing". Creating something that’s 244 pages, were there any times when you thought that was impossible and you wanted to take the easy way? Hayley Louisa Brown: There are always things that fall through when you’re putting something like BRICK together, it’s kind of inevitable and as much as you prepare for it, it never gets less frustrating or disappointing. So in moments when something you’ve put so much time and effort into organising and confirming falls through, it’s always tempting to fill those empty pages with something easy to make the problem go away, you know? But I’ve always been brought up with the mentality that if you’re going to do something, do it properly – so in situations like that it’s always a case of stepping back and taking a breath and remembering why the magazine exists. Where will the next Edition 04 take us? Hayley Louisa Brown: We have a bunch of shoots happening for the new issue whilst we’re out in LA, so it’s already started. I’m hoping the new issue will see an even further development of the identity Catalogue have created for us, as well as expanding out into our new website which will launch in the summer.